My name is Julia Ferreira Gomes and I attend school at Wilfrid Laurier University. 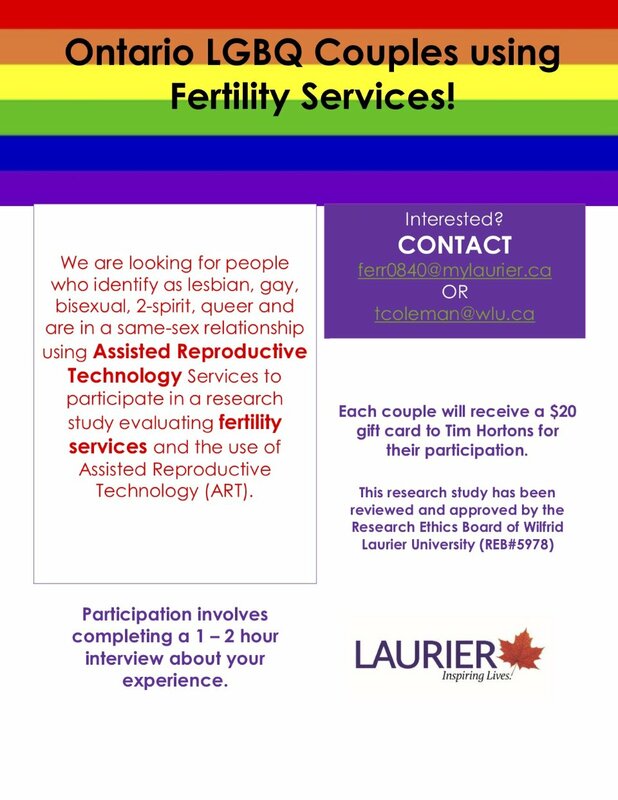 As part of an undergraduate thesis project as part of the HE490 Directed Research in Health Sciences course under the supervision of Dr. Todd Coleman, I’m recruiting participants for a study I’m conducting which explores how lesbian, gay, bisexual, and queer persons experiences in accessing assisted reproductive technology (ART) services in Ontario. I am looking for folks who identify as lesbian, gay, bisexual, or queer, are older than 18, who live in Ontario, and have accessed ART services in Ontario in the past 5 years. The study would take approximately one hour and involves completing a short demographic survey and being interviewed online. As a token of appreciation for your time, you would receive a $20 Tim Hortons gift card. This study has been approved by the Research Ethics Board at WLU (REB #5978).